Flood the underwater world with smooth, even light with the Solar Flare Max from Kraken Sports. With a depth rating of 330' and an adjustable output of up to 10000 lumens, this illuminator is designed to help you capture great underwater shots. It casts a 160° beam angle to illuminate the scene, and has a dial for adjusting the brightness level from 0% to 100% in 5% increments. 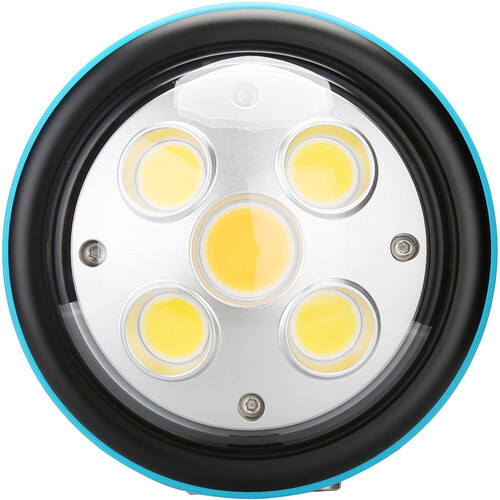 The head of the light is isolated and water resistant, so that even if the battery compartment is flooded, the electronics in the head will stay dry. The included rechargeable battery yields 50 minutes of runtime at maximum output. Also included with the light are a ball mount, a YS mount, a battery charger, and a padded carry case.